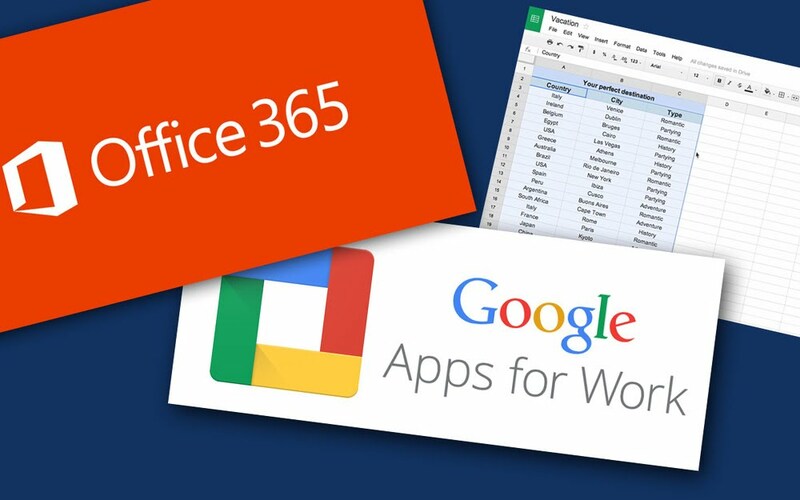 With use of cloud applications growing day by day, organizations around the world are asking which one is better Google Apps for Work or Office 365. Here is a detailed comparison between the same. 2. STORAGE: The next most important concern is storage for your valuable data. Google Apps regular version offers 30 Gb storage per user while Office 365 offers a whopping 1 TB storage per user distributed across all cloud applications in both cases. However, you can buy increased storage add cost of $24 per 100GB or $120 for 1 TB for selected users in case of Google Apps instead of paying up Rs 4260 extra for each user in case of Office 365 as most users will never be able to use 1 TB. Furthermore, Google offers Unlimited Accounts @ USD 120 per year with unlimited storage & advanced features if desired. Another important thing to note is that Google offers unlimited storage for documents in native Google Formats and unlimited storage for Photos. 3. INTRANET : Google Apps includes Google Sites for all users using which you can create Intranet sites for use for your teams, MIS Dashboards, Projects Sites, Customer Information Sites etc. The similar feature is available only in Office 365 E3 version which costs Rs 14400 per user per year (plus taxes). This feature is critical to organize and collate data in a meaningful way and cost in Office 365 seems to be too much. 4. AUTOMATION: Google Apps has online scripting feature which allows for several types of workflow automation like - Automated Newsletters, Automated Task Management, Project Tracking Sheets, Online Approval System, Automated Payment Reminder, Automated Dispatch Information etc. to name a few. Applications need not be running on any computer and no installation is required for the same. 5. SPECIAL FEATURES NOT IN OFFICE 365: The Google Apps includes several features which are invaluable for businesses. These are not available in Office 365 . Offline Editing/Mail : Offline editing is not possible in Office 365 without purchasing MS Office Desktop version or more expensive version of Office 365 - Pro Plus costing Rs 8640+tax per year. In Google Apps this can be done through Chrome Browser of Google Drive App. Google Forms: There is currently no equivalent feature in Office 365 that allows you to collect data in such an easy way, conduct online tests etc. Research & Track Edits: These features not available in Google Docs. 5. GROUPS: Google Groups is a service from Google that provides allows you to create discussion groups for people, share files/folders/intranets for granting easy access to various teams. There no feature of equivalent functionality in Office 365. 6. INTEGRATE WITH HUNDREDS OF APPS like Mind Mapping, CRM, Project Management, Collaboration many of which are free and some are paid. The options for Office 365 are limited. CONCLUSION: Given the Cost vs Benefits as explained above, Google Apps provides more bang for the buck being 74% cheaper than Office 365 with multiple features like Google Sites, Forms, Groups, Workflow Automation, Unlimited Storage (Google Docs & Photos), Voice Typing to name a few. Unless your organization is already heavily invested in Microsoft, Google Apps seems to be a better choice for a taking your business to the cloud and working collaboratively from anywhere. Contact CEOITBOX to help you select & implement the correct platform for your organization. We are one of the very few companies who can help you utilize these cloud applications to their fullest potential & provide specialized training to take full advantage.